Since her recent less-than-successful attempt at portraying herself as a mental health expert, Dr Leaf has been laying low on social media, sticking to bland, innocuous quotes or passages of scripture. Dr Leaf is a communication pathologist and self-titled cognitive neuroscientist. Without any training or professional experience in mental illness, she has also taken it upon herself to act as an expert on mental health within the Christian church. Unfortunately, posting quotes like today’s offering only further destroys her flagging credibility among those with professional psychiatric experience, and adds to the confusion of the rest of the Christian church when it comes to understanding mental illness. There are two main problems with Dr Leaf’s meme: the quote itself and it’s source. The quote itself is wafer-thin, unable to stand up to even the most basic interrogation. For example, we know through basic common sense that the brain changes how we think, our moods, our emotions and our behaviours. We change our mood, our emotions and our alertness every time we have a cup of coffee, or a glass of wine. Hallucinogenic medications like LSD definitely change our framework of understanding the world. Coffee, alcohol, and illicit substances like LSD all change the mood or experience of the person using them because they all temporarily alter the function of the users brain. Though it’s not just external substances that change how we experience our external and internal worlds, but our own internal hormonal ecosystem changes our emotions, our moods, our thoughts and our behaviours. This isn’t so obvious for most men as our hormones are fairly constant, though testicular failure is known to result in reduced energy, vitality, or stamina; depressed mood or diminished sense of well-being; increased irritability; and difficulty concentrating and other cognitive problems. For the female gender, monthly hormonal changes can sometimes result in sudden, marked changes in emotions, moods, thoughts and behaviours. If you aren’t satisfied with a common sense approach, then consider the scientific evidence that personality, the name that we give to our inbuilt ‘framework of understanding the world’ is largely genetic, and dependent on the function of various neurotransmitter systems [1-4]. So to suggest that the brain is not responsible for our moods, our emotions, our thoughts and our behaviours isn’t supported by the weight of scientific evidence. The quote by Kinderman doesn’t stop there, but suggests that “not even the events that happen to us … determines our thoughts, emotions, behaviours”, something that also flies in the face of current scientific evidence. For example, the other forty percent of personality is determined by our environment (specifically the ‘non-shared’ environment, the environment outside of our parental influence) [5, 6]. And common psychiatric illnesses are associated with early childhood adversity, such as schizophrenia  and ADHD . So again, the quote is unscientific. Who then is this Kinderman guy, and why does he disagree with the scientific literature? Peter Kinderman is a Professor of Psychology at University of Liverpool, and the President-elect of the British Psychological Society. He’s a highly outspoken critic of modern psychiatry and what he perceives to be the medicalisation of normal moods and emotions and overuse of medications to treat these non-existent diagnoses. Kinderman believes that it’s our learning history that shapes the paths that our lives take, and so if we simply understand our personal models of the world and how they were shaped by the events and experiences to which we’ve been exposed, we can simply think our way out of any disease process . Kinderman has come out in favour of talking treatments for psychosis in schizophrenia instead of medication, when there’s no scientific proof of benefit for psychosocial therapies in schizophrenia [10, 11] (and here). This, and his staunch opposition of the DSM5 as invalid, makes me concerned about his bias against modern psychiatry, despite it’s many advances, scientifically and clinically. However, I’m surprised that Kinderman would make such a statement because it’s such an asinine argument, I find it hard to believe that it came from a professor of psychology. Kinderman would surely recognise the role of biology in our mental health and wellbeing, even if he doesn’t agree with how it’s managed. Perhaps there’s an alternative explanation. Perhaps Kinderman didn’t say what Dr Leaf has claimed? The answer is, he does, and he doesn’t. So he seems confused, both recognising that biological traits influence psychiatric illness, then denying it. Personally, I disagree with the quote from his book, although I’m just a suburban GP from Australia, so what would I know, right? Though I think the evidence I’ve cited is on my side, and Kinderman is not without his critics who are more than his academic equal. It also concerns me because the logical conclusion of this line of thinking is that psychiatric illnesses have no biological basis, and therefore psychiatric medications have no place in treatment of them. But as I outlined previously, there is good evidence for the beneficial effects of medications for schizophrenia and ADHD amongst other mental health disorders. Dr Leaf continues to ignore the scientific evidence for the biological basis for mental ill-health, medications for their treatment, and even the most basic of all that our mind is a product of our brain. Instead, she’s nailed her colours to her mast and aligned herself with outspoken authors on the fringe of modern neuroscience. Rather than addressing the science behind her opposition to modern psychiatry and neuroscience, she has resorted to hiding behind their quotes, a ‘me-too’ commentator, rather than an actual expert. Of more importance is the confusion that this brings to the vulnerable Christians who follow her social media “fan sites”. The more Dr Leaf criticises psychiatric medications and condemns their prescription and usage, the more likely it is that someone will come to serious harm when they inappropriately cease their medications. And if Dr Leaf won’t come to her senses, our church leaders are going to have to take action, before it’s too late. Vinkhuyzen AA, Pedersen NL, Yang J, et al. Common SNPs explain some of the variation in the personality dimensions of neuroticism and extraversion. Translational psychiatry 2012;2:e102. Chen C, Chen C, Moyzis R, et al. Contributions of dopamine-related genes and environmental factors to highly sensitive personality: a multi-step neuronal system-level approach. PloS one 2011;6(7):e21636. Caspi A, Hariri AR, Holmes A, Uher R, Moffitt TE. Genetic sensitivity to the environment: the case of the serotonin transporter gene and its implications for studying complex diseases and traits. The American journal of psychiatry 2010 May;167(5):509-27. Felten A, Montag C, Markett S, Walter NT, Reuter M. Genetically determined dopamine availability predicts disposition for depression. Brain and behavior 2011 Nov;1(2):109-18. Krueger RF, South S, Johnson W, Iacono W. The heritability of personality is not always 50%: gene-environment interactions and correlations between personality and parenting. Journal of personality 2008 Dec;76(6):1485-522. Johnson W, Turkheimer E, Gottesman, II, Bouchard TJ, Jr. Beyond Heritability: Twin Studies in Behavioral Research. Current directions in psychological science 2010 Aug 1;18(4):217-20. Howes OD, Murray RM. Schizophrenia: an integrated sociodevelopmental-cognitive model. Lancet 2014 May 10;383(9929):1677-87. Thapar A, Cooper M, Eyre O, Langley K. What have we learnt about the causes of ADHD? Journal of child psychology and psychiatry, and allied disciplines 2013 Jan;54(1):3-16. Kinderman P. The New Laws of Psychology: Why Nature and Nurture Alone Can’t Explain Human Behaviour: Robinson, 2014. Buckley LA, Maayan N, Soares-Weiser K, Adams CE. Supportive therapy for schizophrenia. The Cochrane database of systematic reviews 2015;4:CD004716. Jones C, Hacker D, Cormac I, Meaden A, Irving CB. Cognitive behaviour therapy versus other psychosocial treatments for schizophrenia. The Cochrane database of systematic reviews 2012;4:CD008712. 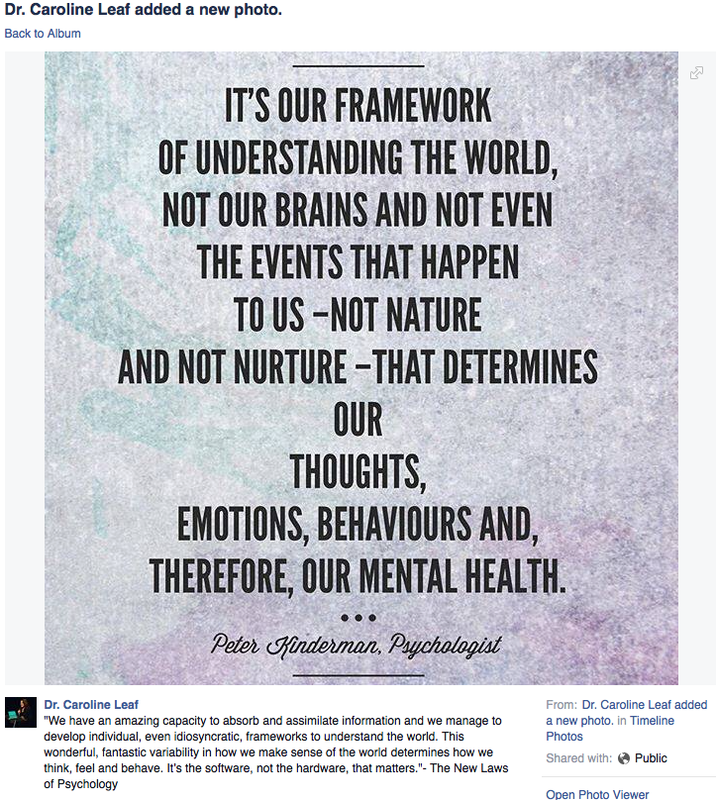 This entry was posted in Biological, Caroline Leaf, Psychological and tagged caroline leaf, cognitive neuroscientist, criticism, Facebook, kinderman, Leaf, meme, neurobiology, pseudoscience, psychology by cedwardpitt. Bookmark the permalink. Wow. This reads as an attack on someone’s character that you disagree with. Hard for me to give you validity when there is an obvious character assignation going on. I think I will just review your sources in full, rather rely on input from a piece attached to a negative agenda. Hi Tina. You’re welcome to interpret my work however you like. If you think I’m out to assassinate Dr Leafs character by critiquing her misleading quotes on mental health, then so be it. If my passion to protect the vulnerable Christians from the barrage of misinformation from Dr Leaf has caused me to be terse or to seem critical, then I apologize. But if I were really trying to assassinate her character, there would be much more effective ways than simply calling her on her social media memes. Thanks for being willing to look beyond the surface, and all the best to you.